Another housing bubble is beginning to burst. Its financial characteristics are different from the 2007-8 housing bubble but it shares one thing in common — that it is caused by government policies. The 2007 bubble was caused by the Federal government insisting on home loan qualification standards changes. Buyers who were not qualified to obtain traditional home loans were encouraged and even subsidized to get loans in states such as IL, CA, NJ, PA, and all other areas. The details of these changes were documented by Pinto and Wallison. The bubble burst because the easy money home loan qualification changes created two prongs of financial instability: 1) persons who were not qualified were allowed to obtain mortgages and 2) the easy money policies rapidly escalated home prices and placed many mortgage holders underwater when the artificially high housing prices crashed. This bubble now being created in the biggest Blue states, while being driven by government policy, has a completely different financial dynamic. This dynamic is best understood by looking at the financial condition of Illinois. 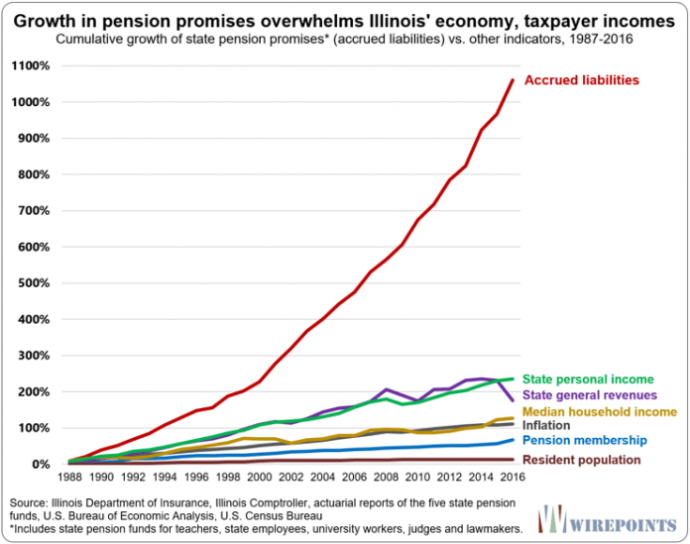 The financial insolvency of Illinois is directly linked to its public-sector pension system. The unfunded public pension liability of the state is $251 billion. But that one fact is only part of the story. In addition to having this unfunded pension liability, the state now dedicates one-fourth of its annual state budget to pension costs. In order to finance the ongoing demands of the public pension system (Illinois has 650 pension plans throughout the state) the state seizes state grant money and state funds lawfully appropriated to pay for public services throughout the state and puts those into the pension fund located in the state capital, Springfield. Since there are 4.8 million households in Illinois the average household owes $52,269 to the unfunded pension costs, and these go up every hour. And in addition to that one-fourth of the Illinois state budget goes to pensions.